What’s the next appliance finish going to be? It’s called “Slate.” Just a darker hue than stainless, and a bit softer looking to me. I like it! How about you? Heather Clawson is a talented young interior designer, living and working in New York City. Her blog, Habitually Chic, is one I subscribe to. Click here so you can read it, too. She works tirelessly at it–I believe there’s a new post every day (amazing). Heather writes about both interior and fashion design. Just a little blurb that’s interesting and informative, accompanied by great pictures! This is the After shot. She’s done a great job of polishing it up and making the most of the space. Nice colors, good organization, homey touches, orginal art that has meaning to her (my kind of girl). This is the WHOLE kitchen! 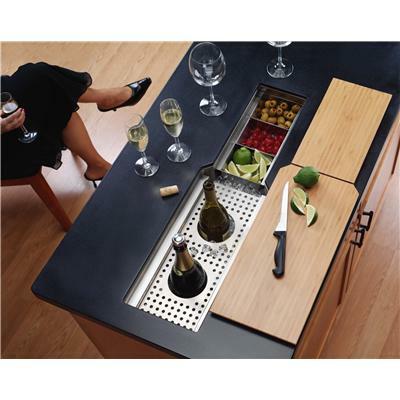 Just wanted to share a few pictures that HomePortfolio.com sent me today about some new kitchen products we can drool over ponder. 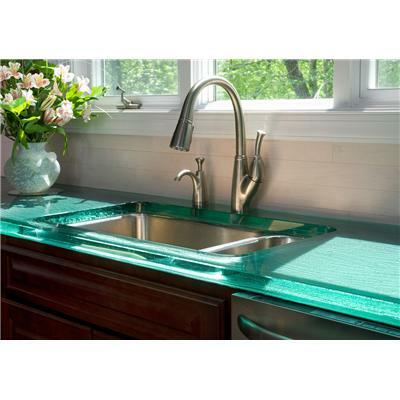 Here’s a splashy little number–a glass countertop. Oh, that blue is divine. Comes in other colors and you can even put LED lighting in it (don’t ask me how, it’s by ThinkGlass, ask them). What will happen when I drop a bowl on it? The same thing that will happen when I drop a french fry on my Dior Couture silk skirt﻿ silly. 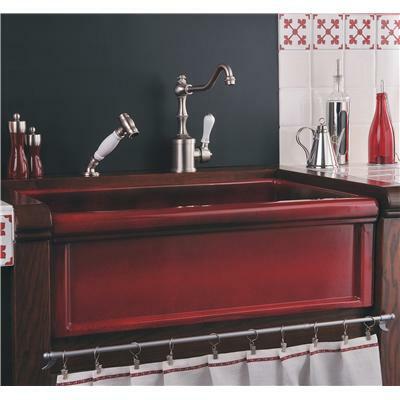 And lastly, here’s the Farmhouse sink by Herbeau Creations. They say that in Provence, those old farmhouse sinks aren’t all white or stainless steel. They say that the color will transport you to the lavendar fields. Oky doky. This is a very pretty, rich color, that’s for sure. 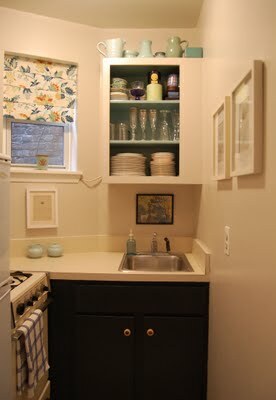 Look at that graphite wall behind the sink. Oh baby, that’s a nice look. I’ve been putting more pictures on the “My Work” page (look on the right sidebar of this blog where it says “DECOCCO DESIGN”, find those words and click). This was one of the pictures I was adding and I found that, instead of a quick caption underneath, I was writing a paragraph.. So I’ll make it a post instead. 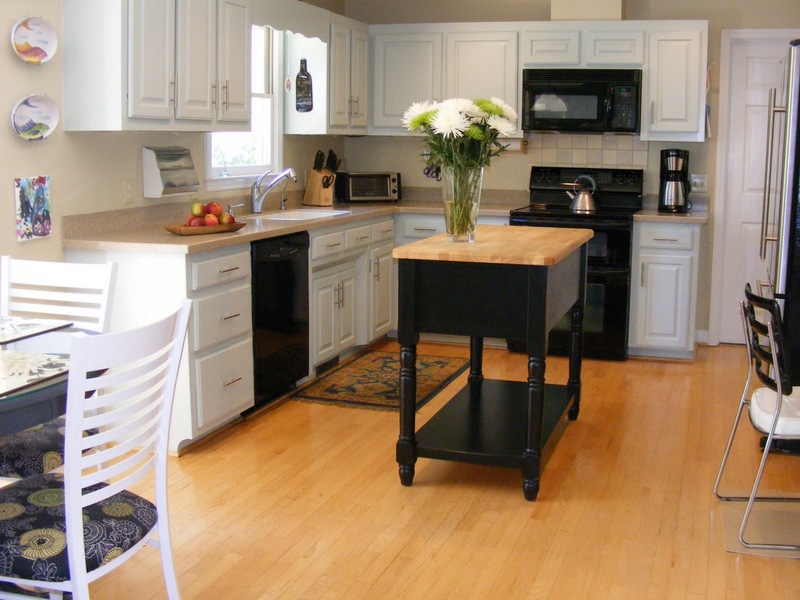 When we moved into this house, we did a LOT of expensive things to renovate and update. Putting in a new kitchen was not in the cards. So we had the old oak cabinets painted this lovely sagey color and the walls a neutral khaki, purchased a new island and counter depth fridge and moved our stuff in. I love this room. There are a few things you can’t see, like the little desk and the pantry, but you get the gist. It’s a nice size kitchen and we could tear it out and make a showstopper, but I hope we never do. This room feels old, warm and cozy to me. It feels like the place where spaghetti sauce is stirred, brownies are made and science experiments are conducted in the sink. And that’s exactly what happens here. I make homemade pizza on that island every Friday (what a mess–are you a messy cook? I sure am!). See those lovely oval Vietri dishes hanging on the wall over on the left (there are 3, you can’t see them all). Underneath those dishes is original artwork by my favorite artist when he was 4 years old (he’s now 5).